It’s Sunday morning in Boston. The cover of the week’s Globe magazine is an image of the city’s skyline against a stunning pink sunset. Silhouetted is Boston Light, the harbor’s beacon for more than 300 years, with the headline “Changing Tides: the Future of Boston Harbor.” Inside are articles about access, development, commerce, water pollution, and the threat of rising sea levels. Topical, right? But this isn’t a recent issue of the Globe magazine: it’s dated November 3, 1985, amidst a decade that has more in common with our present moment than we might think. I was born in the 1980s, and maybe it’s because I can just barely remember the decade that it intrigues me so much. Anyone who knows me can tell you how much I love the music (New Wave! ), the movies (Beetlejuice! ), and even the hair (bigger is better!). And I’m fascinated not only by the decade’s genre-bending artwork but how art was pressed into national public debates on the country’s cultural identity. Hence I was reading the Globe magazine from 1985. I’m on a quest to understand public art and its evolution from plop to participatory during the fraught 1980s. There’s an echo of the 1980s in our present moment, from fashion to politics. Immigration, women’s rights, and race relations routinely made headlines in newspapers like the Globe throughout the 1980s, and many of these debates continue today across social media and other online platforms. The nuclear bomb, AIDS, and the Cold War affected everyday life. Reagan budget cuts gutted government spending on social services like homeless shelters. The decade’s end all but saw the death of NEA. Computers became a part of everyday life. To understand the 80s, we have to go back to the 1960s; another turbulent decade, but one in which social issues like poverty, racism, and classicism were seriously addressed through Great Society Programs. Federal money supported art and artists (working in public or not) through the National Endowment for the Arts (NEA). And city-based corporations, seeking to adorn their glass, Post-Modern skyscrapers, financed large-scale abstract sculptures, placing them in expansive, publicly accessible plazas. Think the Chicago Picasso, or, locally, Thermopylae (1966) outside of the JFK Building in City Hall Plaza. Twenty years after they were introduced in 1964, however, Great Society programs were being reassessed or eliminated altogether in Reagan’s administration. Big businesses left urban areas for the suburbs, and cities across the country faced massive debt. Public art increasingly needed to serve a purpose in public space, addressing topics that interested and served the public. But who was “the public,” and who decided what artwork should be placed where? Just like it does today, public art presented thorny questions about who we are as a society, and if we are truly great. As the twentieth century waned, Bostonians looked to public art to maintain and preserve a sense of place in their city. Boston saw massive alterations to its cityscape as the 1970s gave way to the 1980s. A chunk of the city’s nucleus, the Combat Zone, was razed to make way for shopping centers like Downtown Crossing’s Corner Mall. Would-be shoppers converged on the new, walkable Washington Street by way of the Red and Orange subway lines, both of which were extended and improved during the time. By the 1990s, work for the Central Artery/Tunnel Project (aka the Big Dig) was well underway. Despite these changes, Bostonians didn’t rush to erect conservative bronze monuments to the past. Though Boston’s public art has long been maligned, in truth the city began encouraging and hosting participatory and experimental projects going back to the early 1970s. In the 1980s, however, Boston public art became a way to adorn and memorialize areas of the city affected by development or the Big Dig. Have you ever looked up and noticed Ralph Helmick’s Benedictions (1989; photo above right, provided by Shana Sissel via universalhub.com ) at Park Street, or Buster Simpson’s Situations (1981) while waiting at Downtown Crossing? 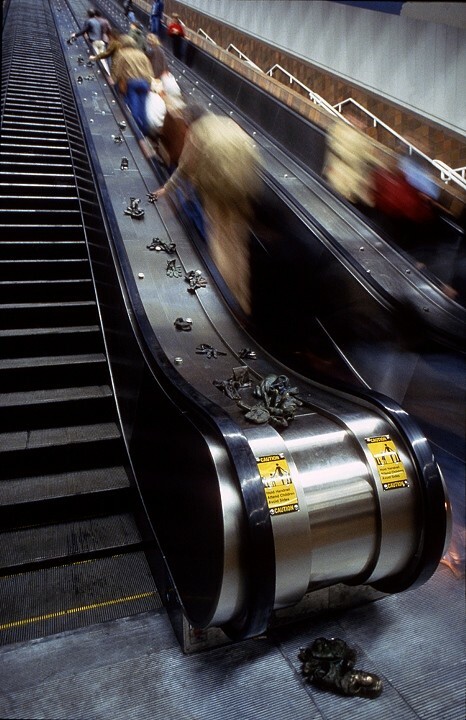 In Porter, you’ve probably seen Mags Harries’s Glove Cycle (1983; photo above left by Greg Heins via magsharries.com) cascading down the station’s steep escalator. What about Sam Gilliam’s Sculpture with D (1983) at Davis? Or, on the other side of town, Paul Goodnight’s Geometree (completed 1987) at Ruggles may have caught your eye; perhaps a poem in granite has stopped you in your tracks, like Mary Bonina’s Drift (completed 1987), at Green Street Station. Maybe you’ve sauntered down Winthrop Lane downtown, looked down, and seen Kate Burke and Gregg Lefevre’s bronze inlaid Boston Bricks (1985). These are but a few examples of 1980s Boston public art incorporating new forms, materials, and most importantly, diverse voices. Behind many of these projects was UrbanArts, Inc., a non-profit organization established at founder Pamela Worden’s kitchen table in 1980. With a background in art history and political affairs, Worden created the organization to nurture revitalization of urban areas through the arts and humanities. In 1983, UrbanArts was contracted by the MBTA to install permanent artworks in several Orange Line stations along the South West Corridor Extension Project. But understanding the full scope of the Project—which dismantled the old Washington Street Elevated system, destroying neighborhoods along with it—UrbanArts wanted to do more. UrbanArts wouldn’t just place artwork, they would collaborate with communities, from Back Bay to Stony Brook, to create it. “The MBTA’s intent was to improve aesthetics and placate a community where a fair amount of disruptive construction was to take place,” Worden and Myrna Margulies Breitbart write in Beyond A “Sense of Place”: New Roles for the Arts and Humanities in Urban Revitalization, a book detailing UrbanArt’s role and work in what would become the Orange Line’s Arts in Transit (completed 1987) project. Going beyond plopping a sculpture in a T station, Worden and UrbanArts engaged each community where a new station was built, forming Site Committees and community participants. Thus Arts in Transit came to include permanent artworks as well as oral history, documentary photography, poetry readings, and granite installations of poetry and prose by urban writers. “By accepting urban space as a site of contestation and struggle, opportunities created for genuine cultural expression can generate a social space that returns to residents a voice in the many economic and political transactions taking place around them,” write Worden and Margulies Breitbart. Over thirty years after the completion Arts in Transit, do these permanent installations still give Bostonians a voice? Today, UrbanArts is Now and There, an organization bringing Bostonians artwork considering place, ecology, and gentrification this year. How do those projects relate to public artwork presented here in the 80s? Is Boston’s public art - permanent or temporary - a way that we can make sense of the enormity of economic and political “transactions” happening globally? These are just some of the questions I hope to explore as Now and There’s critic in residence. I’ll write about public art’s transition from plop to participatory before honing in on specific UrbanArts projects, like Arts in Transit. I’ll discuss temporary or renegade projects commenting on the Big Dig’s effect and long-term implications for Bostonians and their environment. Overall, I hope to establish how Boston’s public art traditions relate to the history of the form globally. We’re living the future of the 1980s, and I’m eager to explore how our public art reflects the seachanges of the past, present, and futures. Myrna Margulies Breitbart and Pamela Worden, Beyond A “Sense of Place”: New Roles for the Arts and Humanities in Urban Revitalization (Boston: UrbanArts, Inc, 1993), 19. Leah Triplett Harrington is a writer and curator particularly focused on contemporary art practices of the 1980s and 1990s. She is also senior editor of The Rib and Big Red & Shiny.